It might sound crazy, being told to eat as your prehistoric ancestors would. But in a world of processed food with a diabetes and obesity problem, fans of the Paleo diet see it as a back-to-basics approach that will make you feel good, be healthier and even live longer. So is Paleo all it’s cracked up to be? A cavewoman walks into Coles. “Got any mammoth mince?” she asks. It’s crazy, right? The idea that we should eat like our Stone Age sisters – clubbing wildebeests and foraging for berries – on the surface seems one of the silliest trends of 2013. But increasing agreement among health authorities that our modern western diet (and its consequence, obesity), is killing us is surely cause for some thinking outside the cereal box when it comes to what we eat. What would our health be like if we ate nothing but what we could catch, kill or collect? However it’s the fascination with self-experiment that sends some Paleo-eaters to unsustainable extremes, prompting a warning from the Dieticians Association of Australia, who are concerned about the restrictive tendencies of Paleo. So relax – you don’t need to be gnawing on a mammoth bone to eat Paleo-ish, but gathering from the grocer rather than the vending machine would get the nod from your prehistoric grannie. Will It Make Me Well? Suffering from type 2 diabetes, arthritis, PCOS or PMS? Clinical nutritionalist Claire Yates (www.indinature.com.au) has seen it all resolved in clients who convert to a Paleo approach. “Plus conditions that people might have put up with throughout their lives thinking it is ‘just them’,” she adds. 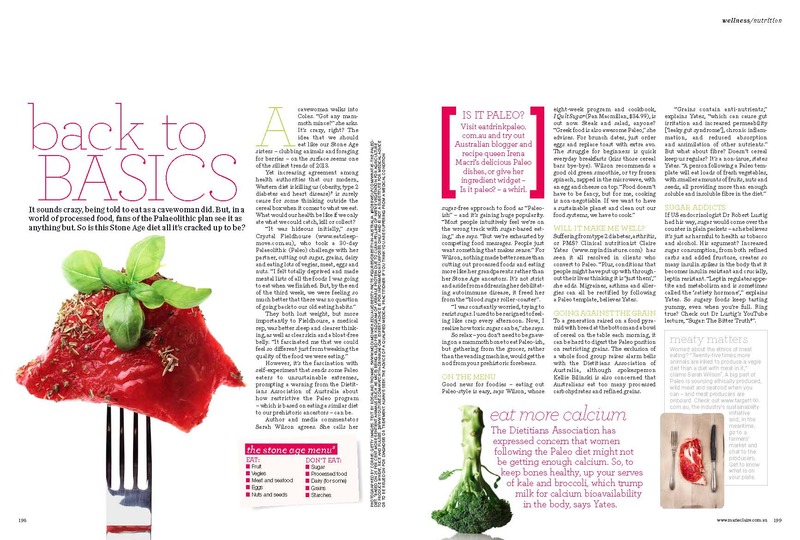 Migraines, asthma, allergies and IBS can all be rectified following a Paleo template, believes Yates. The Dietician’s Association is concerned about women getting the calcium they need eating Paleo. For healthy bones, keep up your serves of kale and broccoli, which actually trump milk for calcium bioavailability in the body, says Yates. Worried about the ethics of meat eating? “25 times more animals are killed to produce a vego diet than a diet with meat in it,” says Sarah Wilson. A big part of Paleo is sourcing ethically produced, wild meat and seafood where you can – and meat producers are on board. Check out target100.com.au, the industry’s sustainability initiative, and in the meantime, get thee to a farmers market and chat up a farmer. Know what’s on your plate. Google eatdrinkpaleo.com.au and try out Aussie blogger and recipe queen Irena Macri’s ingredient widget. Vodka? Paleo. Peanuts? Not so Paleo.